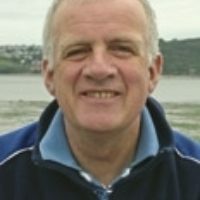 Declan Lyons, author of Cicerone's guide to cycling the Canal du Midi, shares his personal relationship with the route, as well as discussing the history of the canal, what it's like to cycle, route planning tips and the local culture. The Canal du Midi surprised me: I wasn’t looking for it and was barely aware of its existence when it cast its spell on me. Cycling the canal is now a consuming passion: I’ve spent years enjoying and exploring it – finding out its secrets and discovering its quiet charms. It opened up the surrounding countryside for me and introduced me to the joys and wonders of the region: this is just part of the magic of the Occitan. It all started when I was lying looking out of a small skylight in a holiday chalet in the south of France. It was 0600 on a bright mid-May morning, the sky a deep blue. Suddenly five large birds – flying in a cruciform formation – partially blocked out my view of the blue sky for a second. I was up quickly and into my cycling gear, peddling in the direction that the birds were travelling. I followed a tarmac cycle path to a canal and then along it, between the canal and an extensive marsh. I was greeted by the sight of a large flock of flamingos, gathered in the centre of a wide shallow lagoon. My wife, son and I were staying in the campsite while we looked for a house in the nearby village of Portiragnes. The flamingos and the other wildlife I saw in the few days cycling around the area convinced me that this was the right place to buy, and we did so that week. I’m still convinced 17 years later. 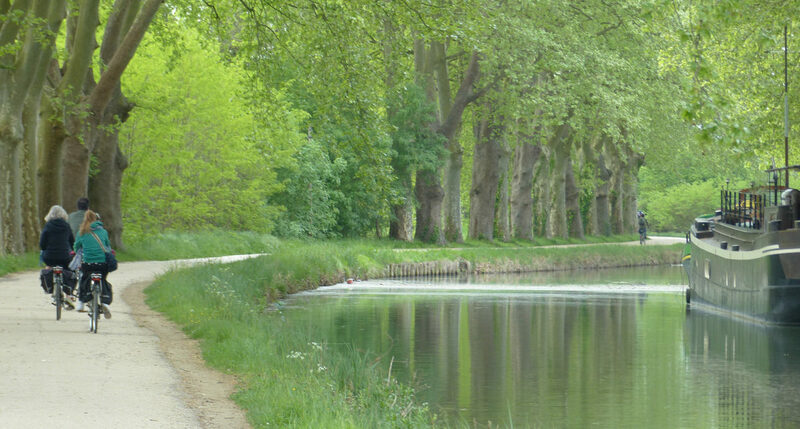 I had come upon the Canal du Midi before, mainly while cycling the Languedoc region of France. I had crossed and re-crossed it while out for a spin but had never taken too much notice of it. Owning a home close to it gave me the chance to explore it in much greater detail. The area’s wildlife, as the above suggests, was the first thing to grab my attention. I had studied zoology and botany, which has been the foundation for a lifelong passion. The canal and its environs gave scope for further study. The plane trees give it a special flavour: their shade shapes the canal’s ecology and delineates it from that of the surrounding towns and countryside. Most of all, the shade made cycling so much more pleasant than on the open, sun-scorched roads around. I gradually became familiar with the canal’s fascinating history and that of the countryside it travels through. The canal represented one of the great engineering achievements of the 17th century, and Pierre Paul Riquet, an interesting character, was the man responsible for its construction. He was neither an engineer nor an architect, but a tax collector who became obsessed with the dream of linking the Atlantic to the Mediterranean. The Garonne River allowed boats to travel from Bordeaux and the Atlantic to Toulouse, but getting from there to the Mediterranean was difficult and involved arduous journeys along mud roads using horses and carts. The idea for the canal wasn’t new – far from it: the Romans, among others, had recognised the desirability of some link between the two seas, and a canal would save having to sail the whole of the Iberian coast before entering the Mediterranean. A reliable water supply was the main obstacle to building it. Riquet, while crisscrossing the countryside collecting taxes, finally worked out how to supply sufficient water to allow for a workable canal, and got permission to set about building it. He had to introduce major innovations to convert the dream to reality. For example, although they had been around for some time elsewhere, pound locks were unknown in the region. He improved and developed them well beyond what had been known up until then. The dam on the reservoir at St-Férréol was the first of its type in Europe. There are aqueducts along the canal’s length, and some of the major ones are extraordinary engineering feats. Riquet had up to 12,000 men and women working flat out to complete the canal. One of the major feats was the completion of the Malpas Tunnel – the first canal tunnel ever built – in just eight days. The towns and villages along the route have deep and multi-faceted histories reflecting the invasions, wars, crusades, businesses and agriculture along its length. Cycling, however, makes the canal special for me. I always been an advocate of slow cycling, setting a pace that allows me take in the life around me as I pedal along. The canal is perfect for this. 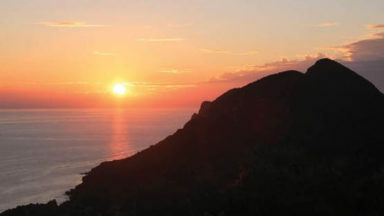 It offers a variety of terrain and difficulty for what, at its core, is a flat route. 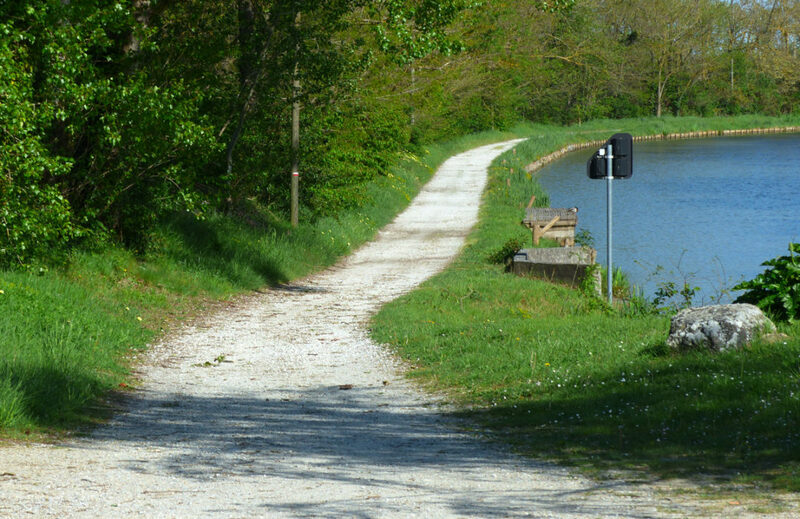 The towpath surfaces varies from tarmac to badly rutted dirt track. Cycling the latter requires care and attention, but it does open up beautiful countryside. Most of the towpath, however, is pleasant and easy to cycle. Toulouse and the towns and villages along the route all add interest. Chateaus, castles and churches feature along the length of the canal. 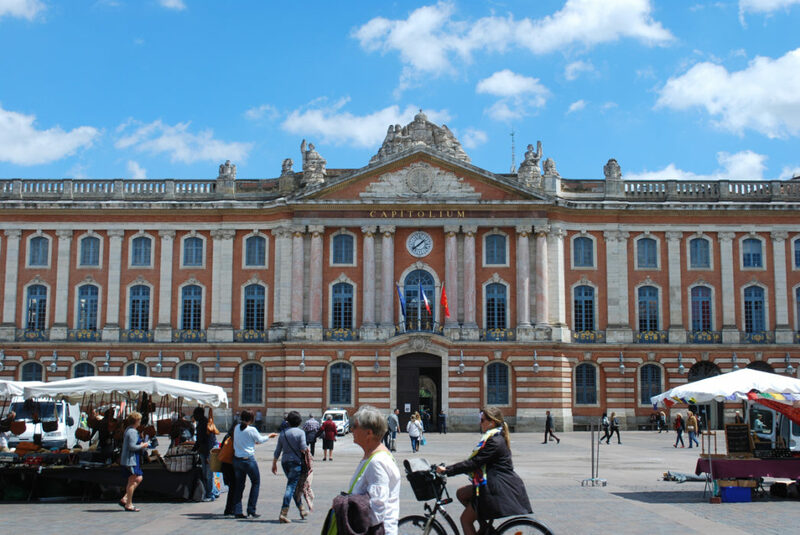 Toulouse, ‘the rose city’, is well worth spending several days in. Carcassonne, with it restored medieval walled Cité, is certainly worth a long stop. 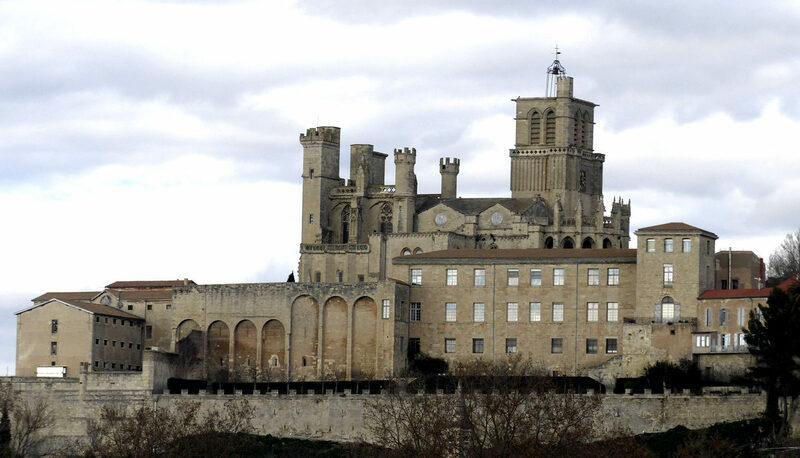 Béziers’ historic centre was the scene of the worst atrocity of the crusade against the Cathars. Sète is a mini-Venice on this stretch of Mediterranean coastline. The canal meanders as it finds its way between hills and hollows. The forces that determine a canal’s route are water supply and the need to avoid climbing or descending, using locks or aqueducts where necessary. The stretch of the canal from Argens-Minervois to the nine locks at Béziers is lock-free for 54kms. This is one of my favourite sections, passing villages such as Paraza, where Pierre Paul Riquet lived for a time. Le Somail is one of my favourite villages on the canal, dating from the 17th century, when it was built to support canal traffic. It has a small port with a narrow cobbled bridge linking the two quays. Le Somail features on the cover of this latest edition of my Guide. Some of the most important works on the canal are also on this stretch. The crossing of the Cesse river is dramatic, particularly in winter, when the river is in flood: the bridge carrying the canal was built between 1689 and 1690. Immediately afterwards is the junction with the canal that leads to Narbonne. Closer to Béziers you come to the Malpas Tunnel, mentioned earlier. Finally, the path comes to the nine locks at Béziers, one of the canal’s most visited sites. 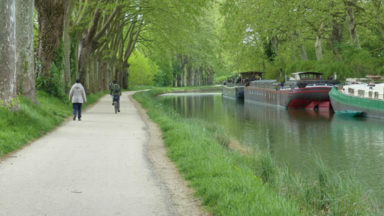 The canal can be cycled in stages, or you can take a short day trip, depending on your interests. Those looking for short, relatively straightforward cycles should try the tarmac stretch from Toulouse to Port Lauragais, which glides gently from the city into the countryside. 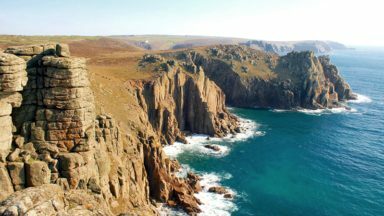 There are train stations relatively close to the route, and a combination of train and cycling allows you to plan a day trip of the length that suits you best. Other tarmac stretches are from Béziers to Portiragnes Plage and Marseillan to Sète. The canal offers a launchpad for excursions into the surrounding countryside. The trip to Minerve from Homps is among my favourites, climbing through the fertile plain flanking the canal to the dramatic gorges of the Cess river. Minerve was a Cathar stronghold perched precariously above the Cesse gorge. Aigne is a village with an unusual old centre, known as l’Escargot (the snail), laid out in a spiral shape around the church, St Martin. Another favourite excursion follows the towpath along the canal that branches to Narbonne and then on to the Mediterranean at Porte la Nouvelle. This visits the Roman town of Narbonne, once the crossroads of two Roman roads, the Via Domitia and the Via Aquitania: this made it strategically important for the Roman Empire. The town developed and expanded, becoming an administrative centre, and today it’s hard to believe that this landlocked town was once a thriving port: it gradually silted up so that it’s now 15km from the sea. 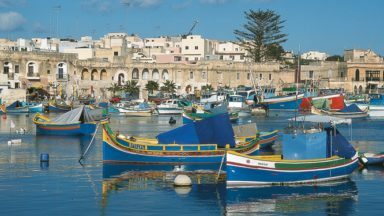 The canal itself carries on to the sea, exposed to wind and sun, passing lagoons, an island and beaches. There’s a lot more to the canal than cycling. Your stops give you an opportunity to taste some local food and wine. Restaurants dot the quays in towns along the towpath. 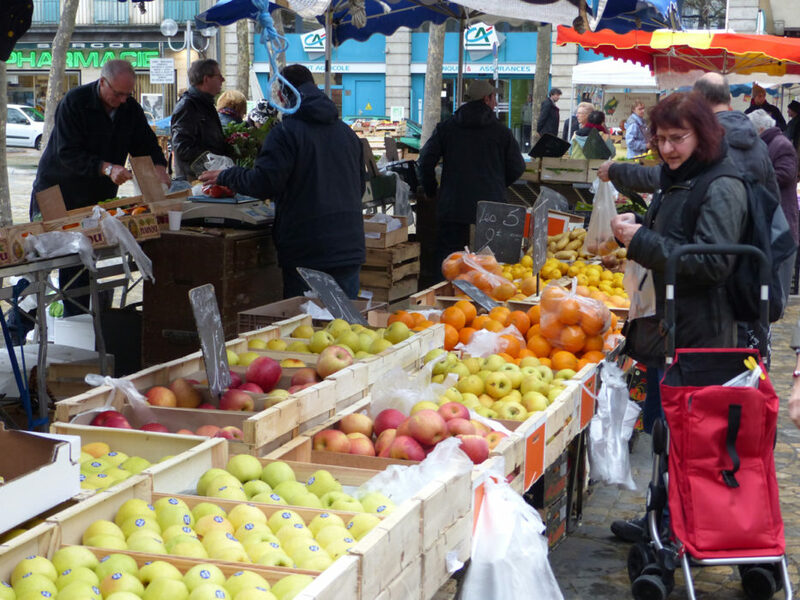 Local producers sell their produce through markets and small shops, often in farm buildings or from temporary stalls. Summer brings festivals and outdoor events to the smallest towns and villages, ranging from classical music to jazz. 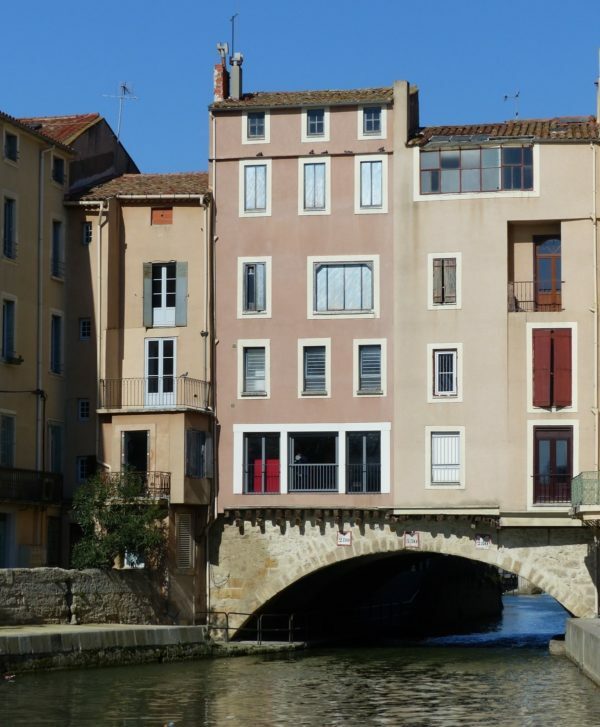 Toulouse and Carcassonne host international programmes, while small towns and villages have their own local events. Bull running is common through the streets of villages around Béziers: the whole community gets involved, giving you an opportunity to meet locals and understand the local culture. The new edition of my Guide includes the changes that have occurred along the canal over the past eight years. One of the negative changes is the continued spread of the fungal disease Ceratocystis platani, which is killing the plane trees that line the canal. The disease was introduced to the region during the Second World War, when infected wooden boxes carrying munitions were brought from the US. 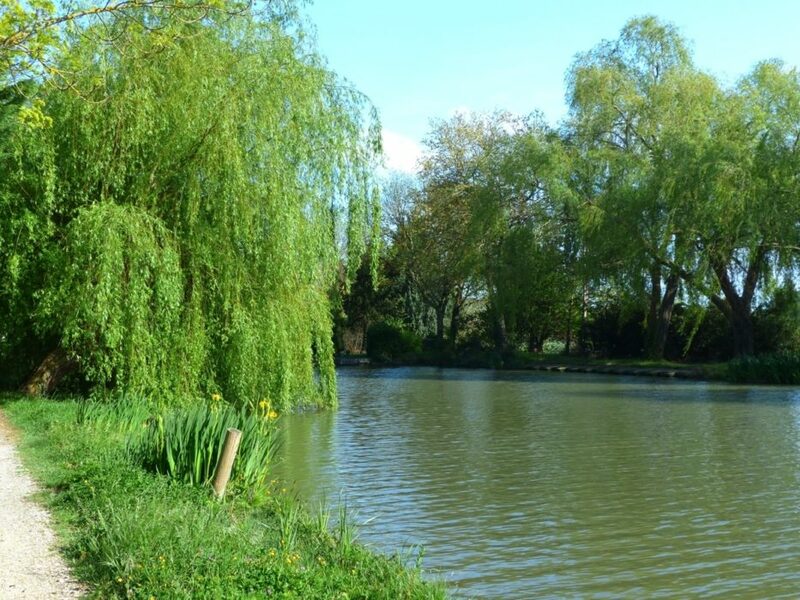 It first appeared on the canal near Carcassonne in 2006, and has spread rapidly since then. The canal company have been forced to fell more and more trees in an attempt to stop the spread of the infection, but admit that there is little chance of saving the 42,000 plane trees that shade the canal’s towpath. The canal company has a programme to fell infected trees during the winter, so that that there are now stretches of the canal denuded of trees. So far these are mainly on the lower stretches, from Carcassonne to Agde. But the disease is spreading. The company is planting disease-resistant plane trees and a mix of other species that in time will grow to replace the absent shade. Those though who want to experience the canal as it has been for centuries should seize the day and cycle it immediately.